[London: 2 May 2018]: Today, the London City Island developers announce the launch of a new terrace encompassing a pop-up DJ booth and cocktail bar. The vibrant new space, designed with a warehouse aesthetic, is the latest in a long line of creative and cultural initiatives to be unveiled on the island. The launch of the vibrant new space coincides with the release of a number of new homes at London City Island. A varied selection of Suites, 1 bedroom, 2 bedroom, 3 bedroom and 4 bedroom apartments will be released for sale on 15th May, with prices starting from £420,000. Forming part of the The Grocer, London City Island’s independent Italian restaurant & deli, the new terrace venue will have its own resident DJ for the summer season, providing the ideal soundtrack for all social occasions. Since opening in 2016, The Grocer has set the benchmark for the retail and leisure spaces across the development, physical proof of EcoWorld Ballymore’s vision to provide residents, and the local community, with a social hub and destination for morning coffee, glass of wine or pizza and Italian tapas. The design of the terrace seeks to provide an escape from the fast-paced lifestyle of the Island’s creative inhabitants. Jazz, funk and soul anthems will compliment a variety of seating and chill-out areas designed with a warehouse-chic, making use of industrial materials such as refurbished shipping containers and steel planters. 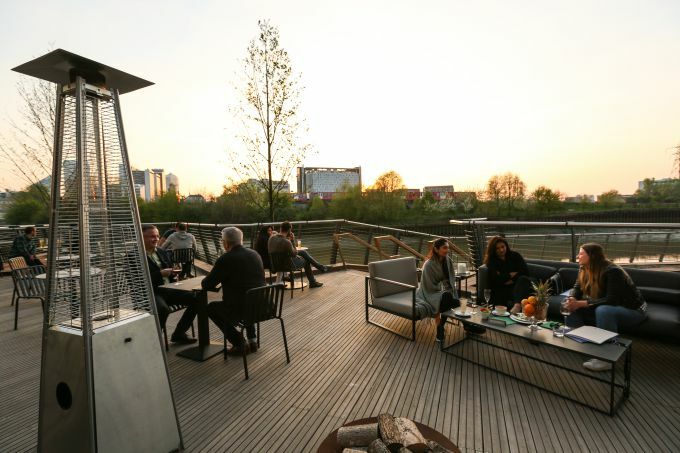 A pop-up bar, serving the freshest alcoholic concoctions will also take pride of place on the terrace, while the waterside location offers guests a panoramic vista of Canary Wharf and The City. Central to Canning Town’s exciting programme of regeneration, London City Island is a landmark development with culture and creativity at its core. Connected to Canning Town by a striking 260 ft. red footbridge, the development will comprise 1,600 residential units, along with independent cafes, shops, restaurants and diverse cultural facilities. A number of the UK’s foremost cultural institutions, including English National Ballet, The London Film School and The Line, will be moving to the island in the near future, giving proof to the claim that it is very much more than just a place to live. Similarly, creative partnerships with arebyte, Studiomakers and Trinity Art Studios have enabled the launch of two art galleries on site, as well a number of studios and workspaces for residents and local creatives.